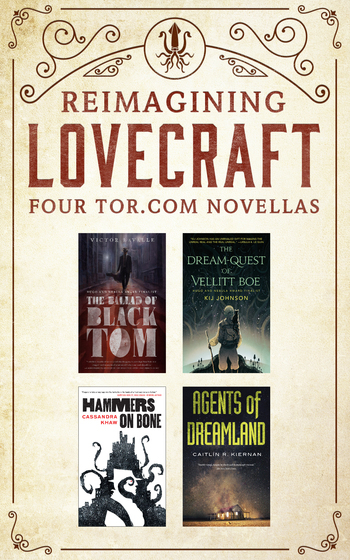 Four new Lovecraftian tales told by four amazing talents. Government agents, monstrous P.I.s, walkers of dreams and magical hustlers meet in the pages of this astonishing anthology of four novellas. The Ballad of Black Tom — the Nebula Award-nominated novella from Victor LaValle. The Dream-Quest of Vellitt Boe — the Nebula Award-nominated novella from Kij Johnson. Hammers on Bone — from Cassandra Khaw, an amazing new voice on the dark fiction scene. Agents of Dreamland — from the multi award-winning Caitlín R. Kiernan.